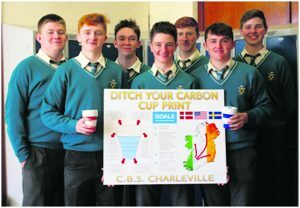 Charleville CBS ‘Ditch Your Carbon Cup Print’ project celebrates a double success story! The project ‘Ditch Your Carbon Cup Print’ was announced by Young Social Innovators as the 2017 Winner of Make our world Greener Challenge. As the winner of one of the eleven YSI Challenges, the project is also in the running for the overall Young Social Innovators of the Year Awards and is invited to present to a panel of judges at this year’s ceremony on May 11th in the Convention Centre Dublin. The project has also qualified for the National Final of the ECO-UNESCO Young Environmentalists Awards. Three students from the project team recently travelled to the semi-final stage of the competition at the Munster ECO-Den. They impressed a panel of expert judges by pitching their eco-action project to secure a place in the Final, which takes place on May 23rd at the Mansion House in Dublin. There was great excitement at Charleville C.B.S on Monday last when the school was notified that the project was shortlisted for the Eco Unesco Final, where they will join over 80 other groups from around Ireland as well as winning the YSI Challenge. ‘Ditch Your Carbon Cup Print’ is an environmental project. The main aim of the project is to reduce Carbon Emissions (C02) locally and nationally by encouraging people to bring their own reusable cup and ditch the disposable paper cup when getting a take-out beverage in garages and coffee outlets throughout the country. 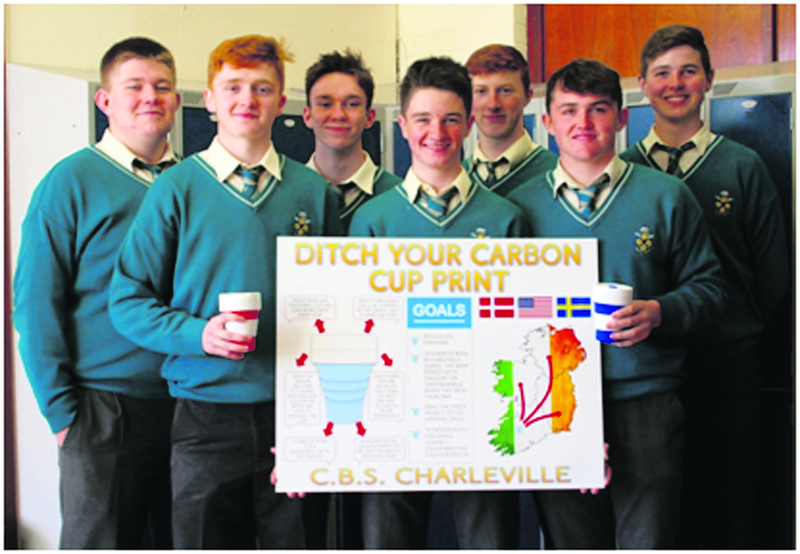 To kick-start the idea, the students have organised a ‘Ditch Your Carbon Cup Print’ (DYCCP) week in Charleville, May 15th -19th. It is hoped that, during this designated week, people will get a discount on a beverage when they bring their own reusable cup when buying a take-out beverage from shops and garages in the town. To ensure the success of the designated DYCCP week the students sought the help, support and advise of the Charleville Chamber of Commerce. Mr. PJ McCarthy and Mr. Sean Fitzgibbon from the Chamber offered invaluable advice and encouragement to the students. The Chamber will mentor the students in this Endeavour and lend its support to the project. The students described their meeting with the Chamber as ‘educational, insightful, a good learning curve’ and reported that their confidence in the work of the project had grown. The students intend to collect relevant data for their project by conducting a survey in the town, before and during the designated ‘DYCCP’ week. The survey will address people’s attitude to: the environment, CO2 emissions, the use of the disposable paper cup versus the use of a reusable cup and the environmental cost to the planet. In the course of their research, the students have formed links with like-minded people involved in similar projects in countries such as USA, Denmark and Sweden. One of the perceived problems with bringing your own reusable cup for a take-out beverage is the inconvenience of the standard available reusable cups. During the ‘DYYCP’ week, it is hoped that a compact, collapsible, totally sealed, reusable cup, which is extremely convenient when on- the –go, will be available to purchase in Charleville. The school will approach local businesses for sponsorship, which under the C.S.R. (Corporate Social Responsibility) scheme might consider donating funds to ensure the success of the ‘DYCCP’ week. Providing sponsorship under the C.S.R. scheme. Pending the success of this week the students will build on the project and advance it further. The ‘Ditch Your Carbon Cup Print’ week will provide a model, which will be presented to the Department of the Environment and the EPA for consideration to be rolled out nationally. Such a campaign would be established as an annual designated week/fortnight held throughout the towns and villages of Ireland. We envisage that once established, nationally, the initiative will be led by local TY students. Charleville C.B.S. will provide schools interested in participating with a ‘DYCCP’ Education Pack, which will enable them to organise, host and evaluate their local ‘Ditch Your Carbon Cup Print’ week. The group are calling on the support of the public to vote for their project for the ‘People’s Choice Award 2017’, an award decided by online public poll. Voting is open from 2nd until 15th of May on www.ecounesco.ie and the winner will be announced at the final. Please get online and vote for this innovative group of boys and their well thought our project!